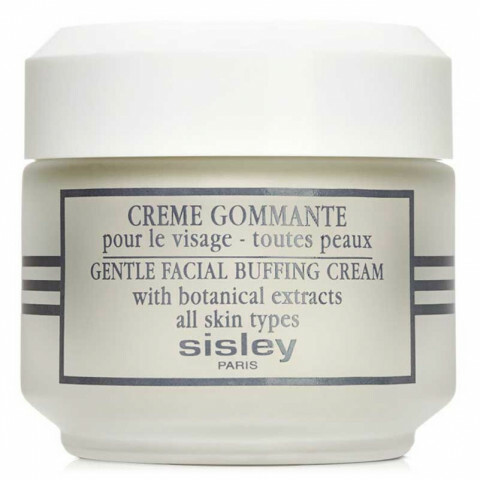 A delicate cream scrub which works gently to lift impurities from the skin surface. This very gentle formula contains Matricaria, which has soothing and softening properties particularly beneficial to fragile skins. By stimulating the epidermis, the Buffing Cream enhances its receptiveness to subsequent skin care products. Gentle Buffing Cream is applied like a mask, then "rolled off", taking with it dead skin cells and impurities that can dull the complexion. With regular use, it helps refine skin texture and preserve its smooth, even appearance. very effective yet super gentle exfoliator. feels amazing on the skin and leaves my skin feeling baby soft! love using this a couple of times a week. Very gentle scrub. It does leave a slightly residue but in a moisturizing way, not greasy. And for someone with dry skin I actually love that! It doesn't take much, and I use it twice a week. I think I can make this jar last about 3-4 months. It's gentle enough for my sensitive skin. I highly recommend. My skin feels so smooth when I use this. This buffing cream is very gentle and non-abrasive for my skin. I use 2x per week to keep the dead skin cells off and controls blemishes. This gentle buffing cream feels very nice and is not too rough like a lot of scrubs. Great for sensitive or fragile skin. Preps your skin to absorb subsequent serums and creams better.